It’s true, comprehensive knowledge is vital when you’re planning to become an ATP. That’s why you’ll want to get your “Doctorate in Flying” with the course designed to put you at the head of the class. Ensure a High Score on Your ATP Written—and get the job! During your pilot job interviews, your ATP written test results will be used to evaluate you, and any topics you miss on the written will generate interview questions. Most ATP test preps out there just cram the question answers and give you test taking “techniques”. The problem is that it’s not enough to just cram your way to a passing score, you need to score high—and fully understand the material. With KING you can do both. Our Video Ground School will ensure you understand every topic on your written by simplifying, clarifying and making it fun to learn the material. The Interactive Test Prep will polish your test taking skills with practice quizzes and tests that exploit our giant test bank of ATP questions accumulated over our 40 years of preparing folks for this pinnacle of FAA tests. This is no time to settle for inferior preparation. Learn with KING, ace your test—and get the job! NEW! Includes a free iPad and iPhone King Schools Companion app that connects to your King Schools Online Video Courses (not available with disc courses), and allows you to download course videos so that they can be watched at any time, with or without an Internet connection. For complete information search “King Schools Companion” in the App Store. It’s true, comprehensive knowledge is vital when you’re planning to become an ATP. That’s why you’ll want to get your “Doctorate in Flying” with the course designed to put you at the head of the class. 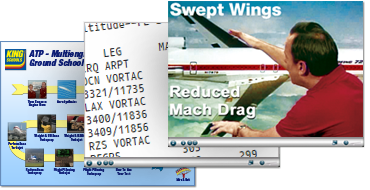 Your KING ATP - Multiengine Ground School & Test Prep Course covers complicated performance charts, regulations, high-altitude weather, IFR procedures, operational factors, FARs, Weight & Balance ... the works. Interactive Test Prep—the icing on the cake! KING's ATP Interactive Test Prep, included with your course, allows unlimited random practice tests, and lets you systematically review and focus on the areas that need extra attention. You can study groups of questions, or every question—topic by topic, or in whatever order you choose—until you're confident you're ready to ace your exam. Coupled with the video presentation, your ATP test prep will guarantee your success. The result? Solid facts, complex concepts simplified, and material that stays with you long after you've passed your FAA ATP Written Exam. KING´s clear, simple, fun presentation means you get the big picture you need to be the true master of your flight. You´ll have the practical tools to really use your ATP Certificate (aka - ATP License). And having the big picture means you´ll be ready to deal with the unexpected. You´ll know how to make timely decisions and take action before you and your passengers are at risk—so your flying will be confident and fun! This course is designed to prepare you to take and pass the FAA ATP Knowledge Test. First, select the "Click HERE to Start" menu icon on your ATP Ground School & Test Prep Course home screen. From there, you will learn how to use the course effectively with and gain insight to the features and benefits of the course. Just follow the path from start to finish; it's that easy. Of course you can skip around if you chose but we recommend staying on the lesson path. Some lessons may be more challenging than others, but one of the many advantages of having a home study course is you can repeat any lesson over and over again. 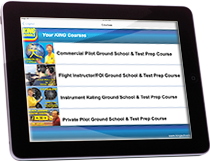 The ATP Ground School & Test Prep Course contains approximately 11.5 hours of video clips. Of course, when you take a King Schools course, it is like having a flight instructor with you 24 hours a day, seven days a week. You can review the material as often as you like at anytime. Sometimes, you may want to review a video segment a couple of times. King Schools ATP Ground School & Test Prep Course contains a text question explanation icon that contains a thorough explanation of the test questions. Click on the icon when you are in the question review that follows each lesson segment and you will have a pop-up window containing a thorough explanation of the test question. You can have lifetime access to your ATP Ground School & Test Prep Course. Remember, with the online media, the course is also automatically updated and will always be current.